Putting text into images is an essential operation of image editing. Photopea offers a rich set of tools for working with text. 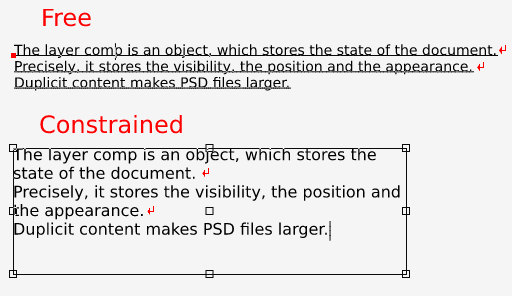 Text is stored in PSD documents inside Type Layers, which have a thumbnail with a capital letter T on it. Free text - defined by the point of origin. The text starts at that point and continues on a single line. Lines have to be broken manually (by hitting Enter). Constrained text - defined by the rectangle. Words are wrapped automatically into multiple lines to fill the rectangle. The Type tool is used for working with Type layers: . To create a free type layer, choose a Type tool and click (press and release) the mouse at some place, which will become the origin. To create a constrained type layer, press the mouse and drag it to draw a rectangle, then release the mouse. After creating the new Type layer, you can start typing. There are two important actions when editing type layers: Entering the layer and Escaping the layer. To Enter a type layer, just click on it with a Type tool (newly created layers are entered automatically). After entering the layer, the environment is locked and you can edit the layer (and nothing else). To do something else (e.g. edit another type layer), you must escape the current layer first. To escape the type layer, you must confirm or cancel your changes using buttons in the top menu. Escaping and canceling changes is also possible with the Escape key on the keyboard. When you have entered a type layer, many ways of editing are possible. You can select any text with mouse, delete it, add a new text, copy and paste etc. When it is a constrained text, you can also change the size of the rectangle by moving its corners.